Trailing 5-33 early in the second half, Swys de Bruin’s mixture of youth and experience punish the indisciplined Rebels. 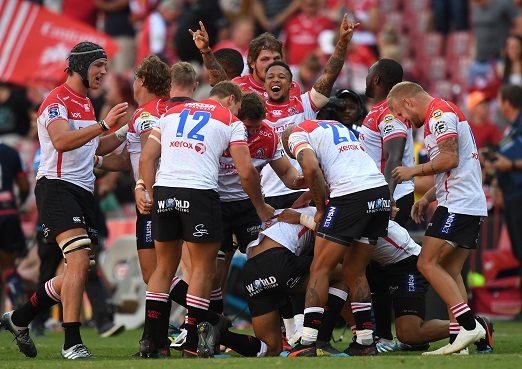 Staring down the barrel at half-time, the Lions produced a miraculous turnaround in the final 40 to claim a thrilling a 36-33 win over the Rebels at Ellis Park on Saturday. The Rebels initially made a mockery of the Lions’ poor defence, running in four tries for a 26-5 lead as they bulldozed the hosts up front and had them in tatters. Yet after scoring early again after the turnaround, the Australians’ discipline disintegrated as the Lions came roaring back with some familiar attacking verve. They conceded an incredible 20 penalties, a toll that eventually led to two of their players spending time in the sin bin. However, it still required a 80th minute penalty by reserve flyhalf Gianni Lombard – after a great scrum – to eventually save the day for the Lions. Who was the star in this match? The chaotic nature of the game truly made this a difficult exercise. The Rebels’ pack was outstanding in the first half and the halfback pairing of Will Genia and Quade Cooper pulled the strings well. However, they faded badly. The Lions were sparked to life by the injection of the experienced duo of Andries Coetzee and Lionel Mapoe. The Lions started off so positively by scoring the game’s opening try through captain Malcolm Marx after a short lineout throw. Marx had some good interplay with prop Dylan Smith before getting the ball back to crash over for a 5-0 lead after just five minutes. But the home side’s early foundation came crashing down as they patently disintegrated. Full credit to the Rebels for taking advantage, but the Lions’ first-time tackling was shocking. Two of the Aussies’ tries came from first phase possession. For a side that prides itself on its set-pieces, the Lions were at times wayward too. Fundamentals will have to improve. The Lions took full advantage once Billy Meakes was given the Rebels’ first yellow card. Regardless of one’s opinion on their style, the home side stayed true to it and, with the experienced replacement backs leading the way, came roaring back with four tries of varying quality. While they were in control in the last five minutes, the Lions will need to address their on-field communication in terms of leadership. The sight of Marx asking the touchline what to do with a penalty isn’t an endearing sight. Lions – Tries: Malcolm Marx, Marnus Schoeman, Andries Coetzee, Lionel Mapoe, Courtnall Skosan. Conversions: Elton Jantjies (4). Penalty: Gianni Lombard. Rebels – Tries: Reece Hodge, Billy Meakes, Quade Cooper, Isa Naisarani, Tom English. Conversions: Cooper (4).